Some people you never forget. Some places you miss like old friends. Such was the case with me at 3:00 a.m. on April 17, 2013. The previous October I had, for the final time, departed the back door of the American Building at 333 N. Pennsylvania where I’d worked for nearly five years. Though it had some notable blemishes, I loved that old building. The aged smells; the creepy basement; the drafty stairwells; the inconsistent elevators; the sudden, unsettling spectral moans that came from the windows when it blustered outside; and even some of the less-enjoyable quirks had, over the years, become comfortable companions. 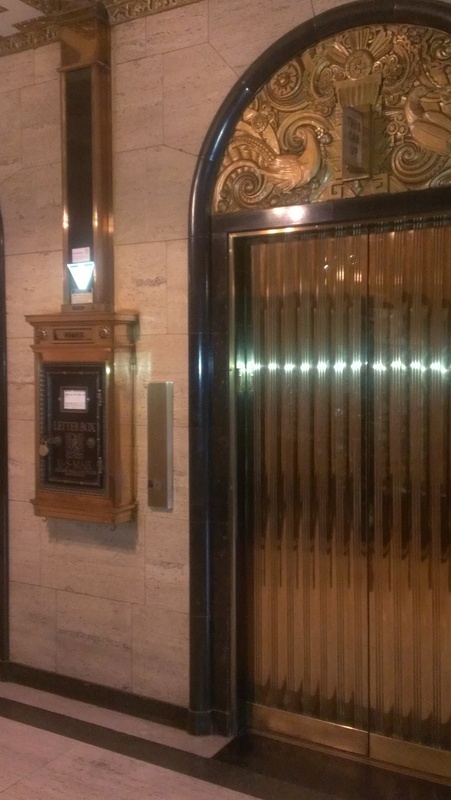 The impossible mailbox and the inconsistent elevators — all a part of the American Building’s charm. 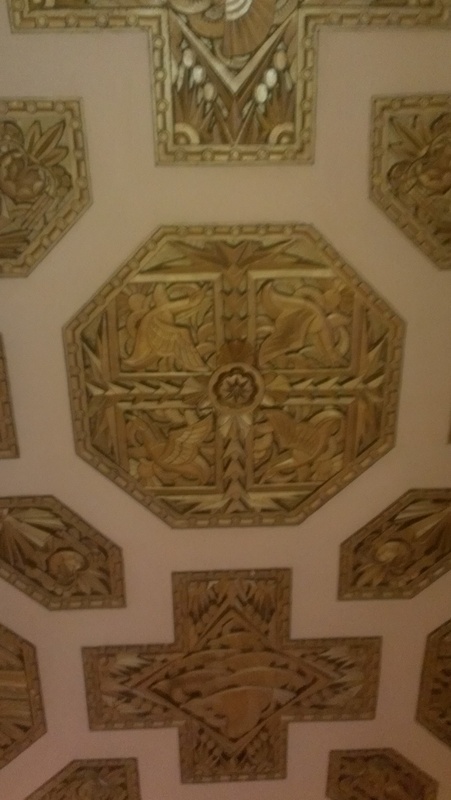 As I left it, the building’s early Art Deco glory still peeked through, despite evidence of indelicate handling by janitors and tenants, though the lobby still boasted some magnificent marble, brass and plaster details. 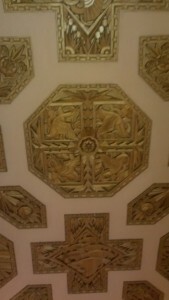 Ceiling detail of the lobby in the American Building. 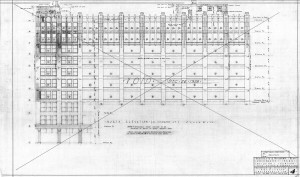 While the features of some floors were completely unknown to me, the tenth floor was well known for its luxurious carved-wood panels as well as spectacular views of the surrounding parks and city skyline from three directions– an excellent vantage for parades and fireworks. 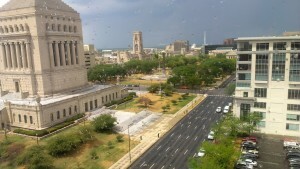 The view from a tenth floor window on a rainy summer day in 2012; a pleasure to watch the seasons change the Indiana War Memorial Plaza and University Park. 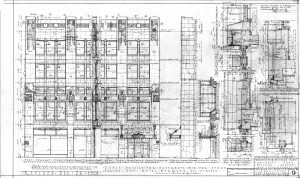 The unofficial “11th floor,” seemingly an afterthought to the structure, was nothing more than the addition of a brick and stucco hut on the roof, accessible by a spiral staircase from the tenth floor only. The concrete penthouse floor boasted a surprising collection of inlaid tile and stonework odds-and-ends. It was a quirky little hide-away of stained glass and old wood; it was a lovely spot that was too hot in the summer and too cold in the winter, but always just right for a quiet 10-minute work break. 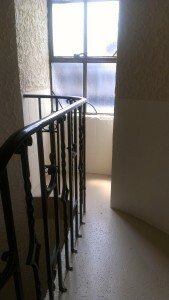 The “11th floor” was a place to ponder questions like: Who built this odd little oasis? And how did they come to choose such a pleasing mish-mash of materials…? An incomplete view of the charming “11th Floor” doesn’t do it justice. Is the random mixture of stonework and tiles a remnant of other Rubush and Hunter projects… or perhaps from former tenant, Wege Marble & Tile? The original building circa 1913, then a red brick structure. 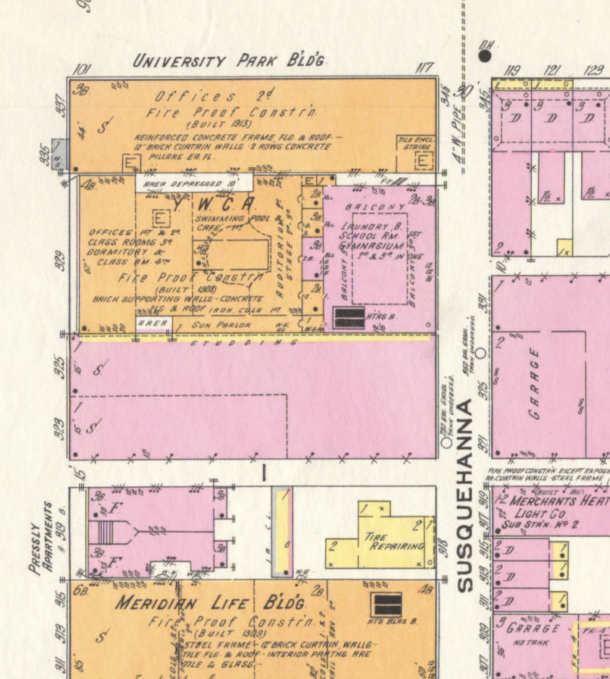 The base of the building was constructed in 1910-12 as a modest three-story low rise structure and named the “University Park Building,” likely due to its location directly east of said park. This rejected elevation showing a more faithful adherence to the look of the original building, is a work of art in its own right. 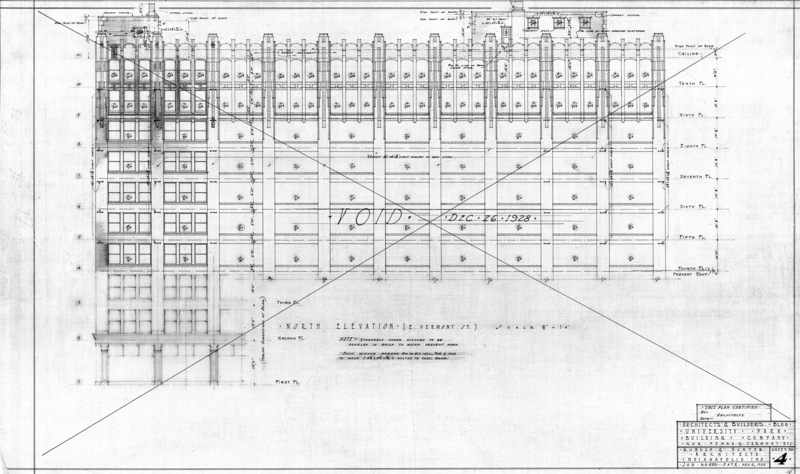 It was replaced with another plan in late 1929. 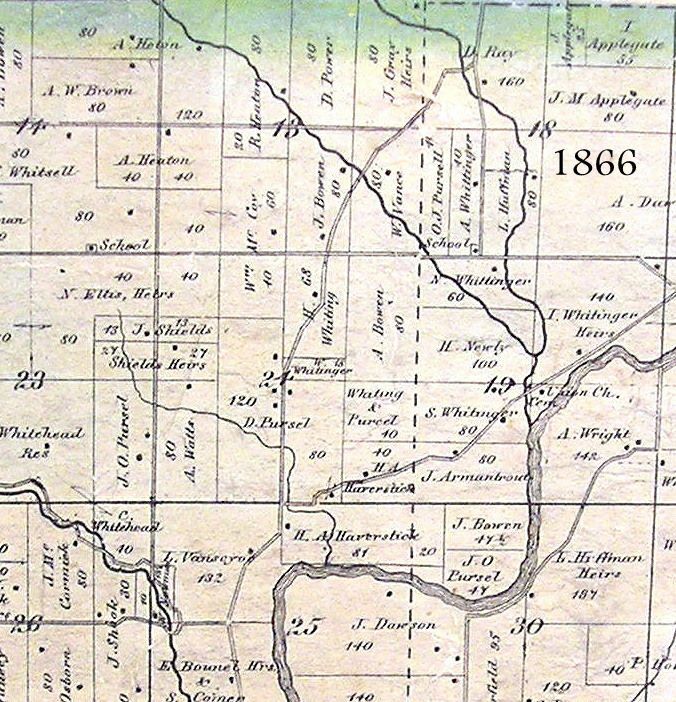 A look at the 1898 Sanborn map revealed that the city block, which is currently bounded by Vermont, Pennsylvania, New York and Delaware streets, was at that time, bisected by two others: Susquehanna (later to become Talbott) and Tippecanoe streets. 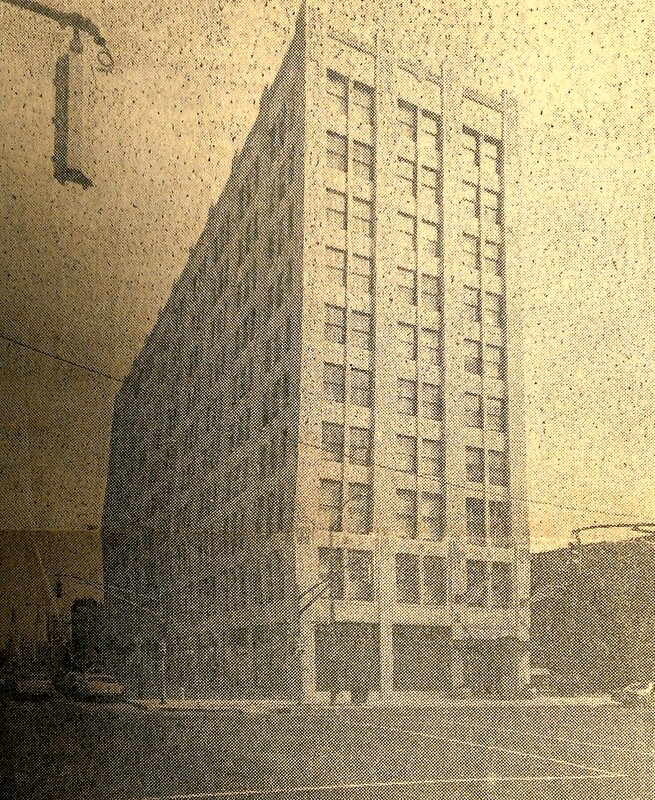 Research yields spotty information about the tenants of the original building from Chamber of Commerce and American Federation of Labor reports, and newspaper ads. Early occupants seem to have centered largely around the building trades. A Journal published by an early tenant of the University Park Building. Upon completion in 1929, the newly dubbed “Architects and Builders Building” became headquarters to the renovating architects themselves, as well as home to the firm of S.E. Fenstermaker, Heating and Mechanical Engineers, Wege Marble & Tile, and several insurance companies. 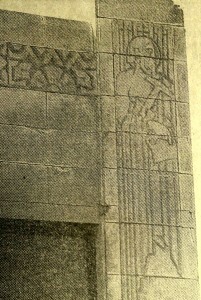 The greatly enhanced structure now featured impressive Egyptian-relief pier carvings at the second and tenth floors. The carvings are said to depict figures associated with construction trades and were heavily influenced by the Art Deco stylings of the time. The lobby was also adorned with an arch inlaid with travertine marble in the form of a landscape just inside the entry and cast plaster ceiling moldings. 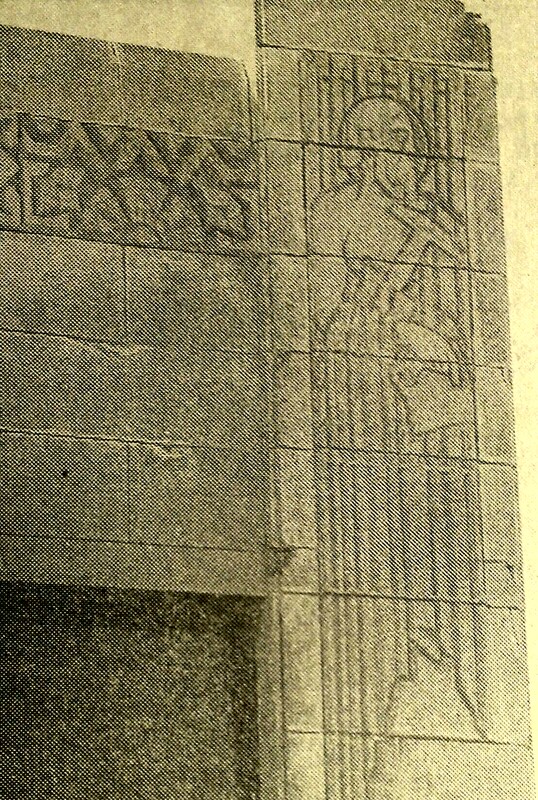 Detail of one of the Egyptian-relief pier carvings at the tenth floor. For more than 40 years, this location was the seat of the city’s booming architectural profession and building trades. 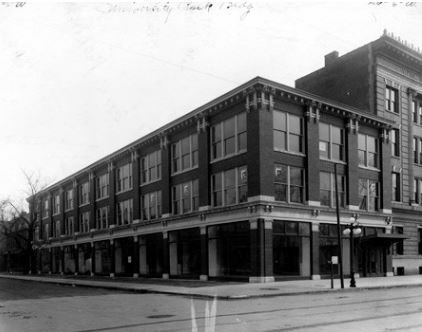 In the early years, the first two floors housed exhibits and displays of the finest building materials, as well as a state-of-the-art library of design books and renderings. The floors above offered large windows to provide ample light to tenant architect’s suites. Rubush and Hunter located their own offices on the top floor in a 9500 sq. ft. space which featured specially designed wood cornices and detailing. The 10th floor of the American Building: notice the whimsical face that winks from one of the carved panels. Is that Rubush…. or Hunter? By the early 1970s tastes shifted and taller, more modernized buildings began to draw tenants away from the location. In 1974, occupancy dropped below 25 percent and the building went into foreclosure. It was purchased by American Fletcher National Bank and thankfully marked for rejuvenation rather than demolition. The 1978 “facelift” came complete with a new name: The American Building. New tenants included Waterfield Mortgage, Western Union, Shoppers Charge, and American Fletcher. The Architects and Builders Building as it looked in 1978 when it was purchased by American Fletcher National Bank and renamed. Yet another 40 years brought the building new ownerships and new challenges. 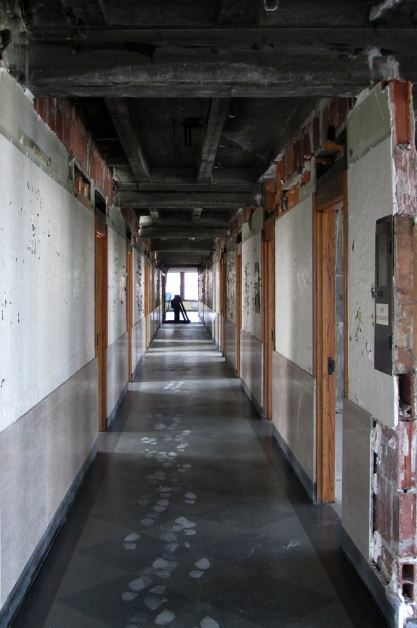 In 2012, the building with its former glory long-faded, was only 47 percent occupied. Tenants included bankruptcy attorney Mark S. Zuckerberg, the Indianapolis Local Initiatives Support Corp. (LISC), and the Greater Educational Opportunities (GEO) Foundation. 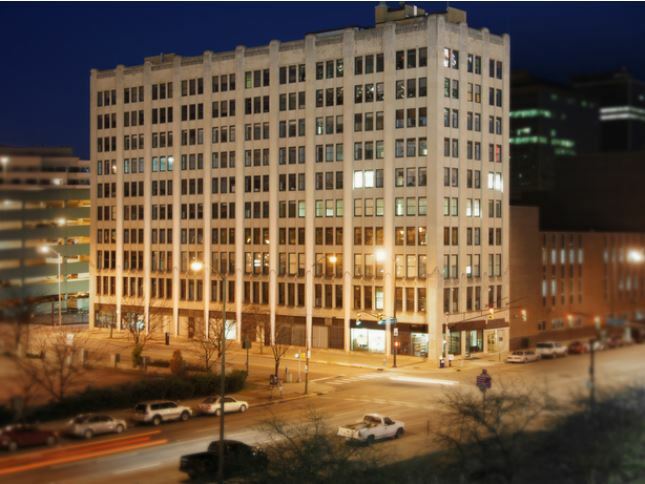 In February of that year, the parent company of the Indianapolis Star sold the building for about half the asking price to two local real estate firms. Reborn once again, construction is underway at the time of this writing to retrofit the building to accommodate 72 apartments. Rents will range from $900 to $1,500 per month, depending on the size. The facility will have an exercise room, business center and community space. This newest repurposing is expected to cost $7-10 million. The ground floor will retain commercial space. Construction is scheduled to be completed in late 2013. 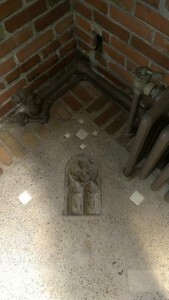 Some elements, such as the original floors, will be preserved. Curiosity about how the historic design elements would fare in the new incarnation led me to DkGr, the architects for the project. The firm reports that while little of the American Building’s original construction has been left intact on the upper floors, the initial circulation pattern has been restored which, in turn, has allowed for the restoration of the terrazzo floors on levels 4-10. 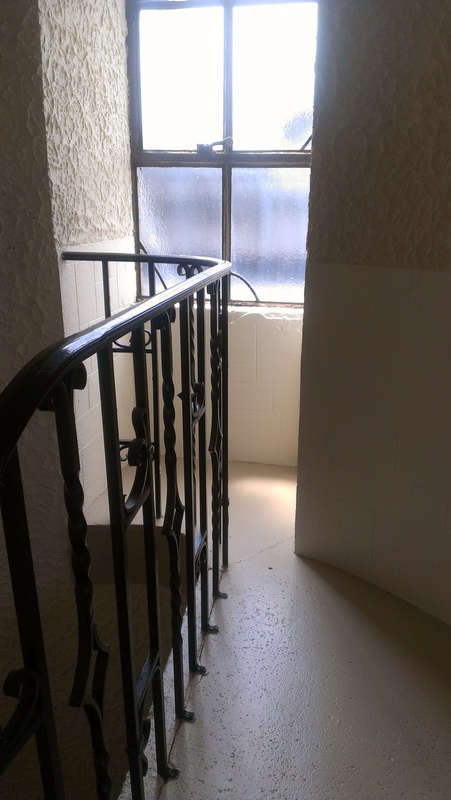 Thankfully, my “11th floor” thinking spot will also remain (stained glass and all), and will be included as part of a large two-bedroom unit that houses the historic spiral staircase which services the small penthouse. Top of the spiral staircase: one wonders if a plant ever graced this character spot that was too small for human habitation. 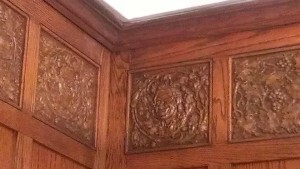 One additional point of interest is the second life given to some of the office doors salvaged from the building during a much earlier renovation of the 9th and 10th floors. They can be seen at the restaurant Bluebeard on Virginia Avenue. Do you have memories of the American Building (in any of its three incarnations)? If so, please share them in the comment box below. 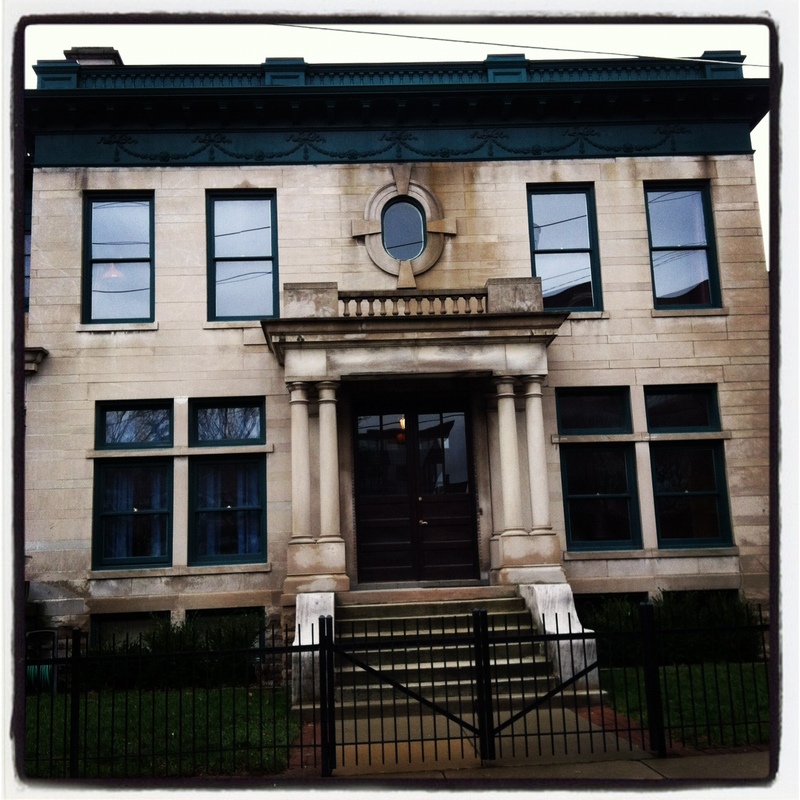 Personal stories add to the richness of Historic Indianapolis! 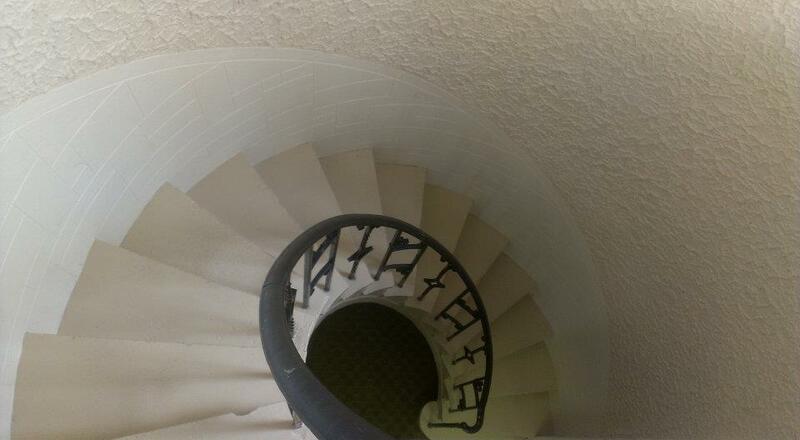 Hidden charm: spiral staircase leading to the “11th floor” penthouse. Special thanks to: Anson Keller of DkGr, Archinect, the Indiana Historical Society, Library of Congress and the Indiana State Library. AFNB sent me to class in the building many years ago for a week. The lobby details still are remembered as one of the more outstanding spaces I have seen. A gem many have never seen. Thank you for giving me pictures and details. My pleasure, David! I was so pleased to learn from the architect that at least some of the 1929 details will not be disturbed. I am grateful that investors sought to repurpose rather than start from scratch. 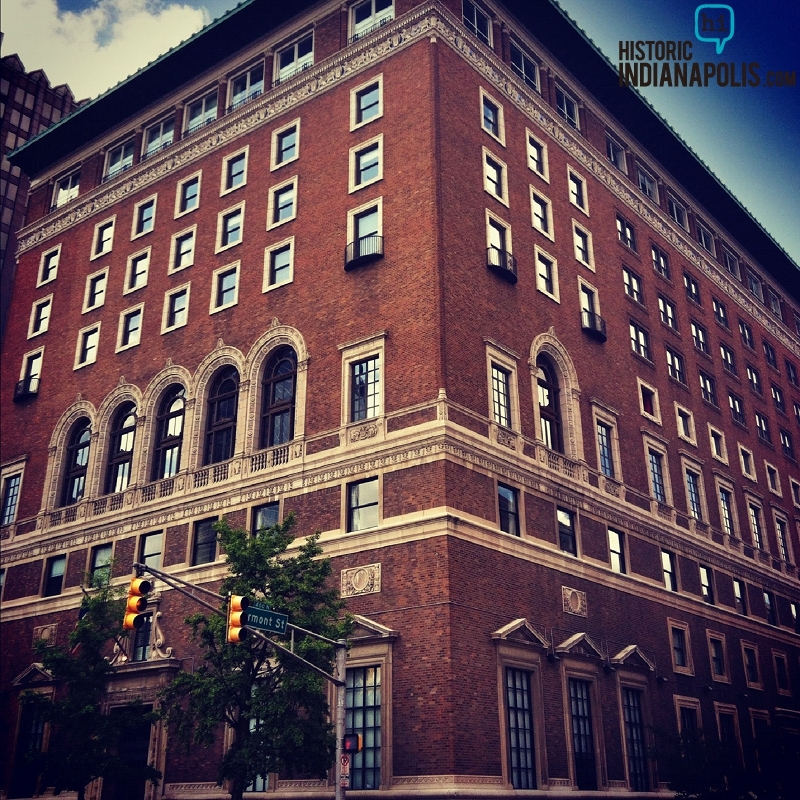 My one experience with this building was going to the Indianapolis Star and having a photo taken for a new article. I met the photographer in the Star building, and she lead me through the maze of that complex. We walked through a door, and the next thing I knew we were in the American Building. We must have been on the 4th or 5th floor. The thing that struck me was the natural light coming through all of the north-facing windows. 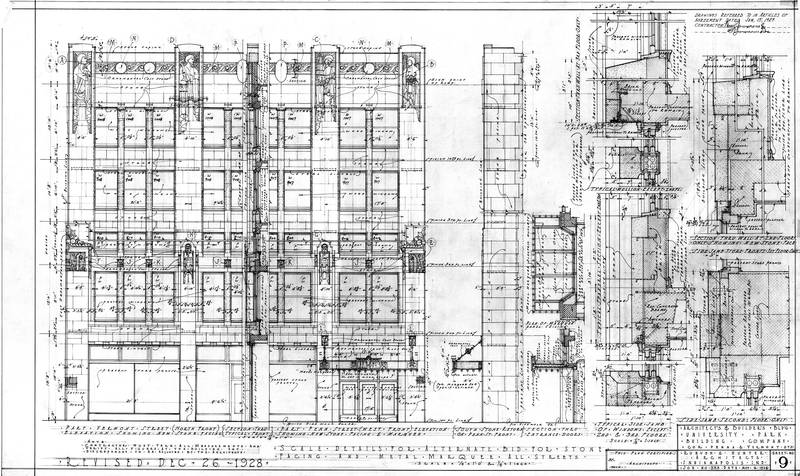 No wonder architects loved the building. It also didn’t surprise me that the Star photographers used this area as a make-shift studio for head/shoulder shots. Glad to see it is being re-purposed. LOVE the story about the Rubush and Hunter floor, and the “secret” room. 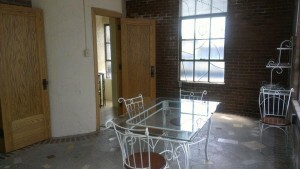 Makes me want to become an apartment dweller again and rent the space! 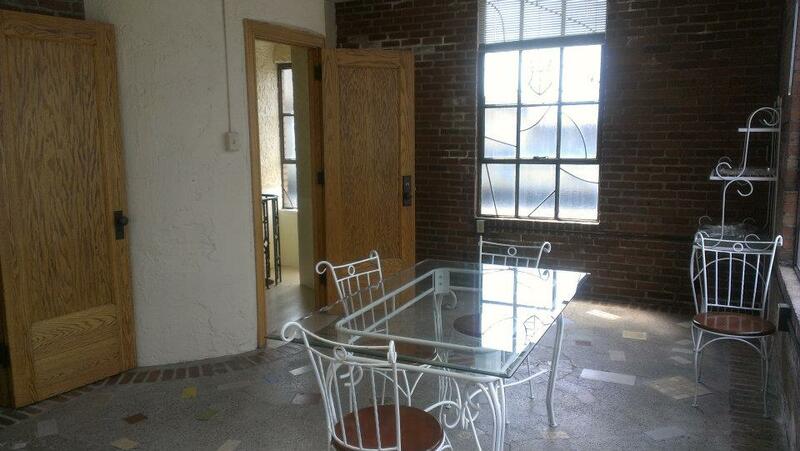 Maybe someone could use this floor for a fundraiser/tour so it could be seen before it is rented? I was especially glad to have the opportunity to meet you in Attica a week ago. Your mother, Joan Ward, remains one of my favorite students who helped me survive my first year of teaching English at West Lebanon High School in the early 50’s! I love the history of the American Building you provided. It brought back memories of the summer I spent in the YWCA on Pennsylvania street when I worked at Fort Benjamin Harrison. 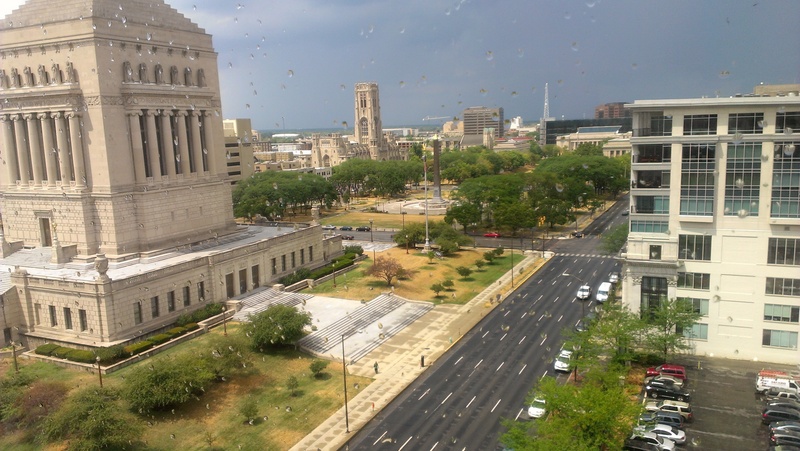 I have been intrigued by the growth and change in Indianapolis for half a century! It has evolved from a cattle town to a sophisticated city of business. I have often wished some of those old buildings could speak. I appreciate the efforts of people such as you who are able to bring them to life again. My husband, Don, and I have been required to visit the old warehouse that is presently serving as an antique mall when our son and his wife visit from Boca Raton, Fl. where she is a home designer. She is often able to find unusual items there that she can use in her work. 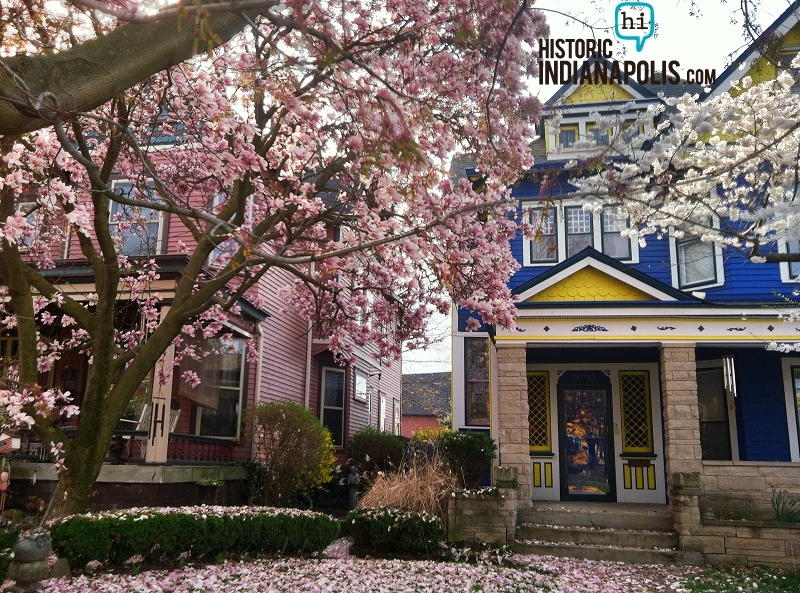 I look forward to future articles by you and others about the history of Indianapolis! Mrs. Slauter, it was a delight to meet you, as well! I treasure your compliments. Please feel free to share, in comments, any recollections of that YWCA (now a part of the Indianapolis Star complex), as it was adjacent to the American Building. Best regards! My father, Sam E. Jenkins, worked in this building as an electrical engineer for the architectural firm of Allen & Kelly, which was in business from the late 1930’s to around 1960. Dad worked there in the late 40’s and early 50’s, and he always referred to it as the Architects and Builder’s Building. Later, I was the project manager on that 4 story addition you saw going up on the 429 N. Pennsylvania building, and I, in turn, watched the renovation work progress on the Architects and Builder’s building. I wasn’t aware, until your article, that that building also started out as a shorter building, and then acquired a major addition on top of it.